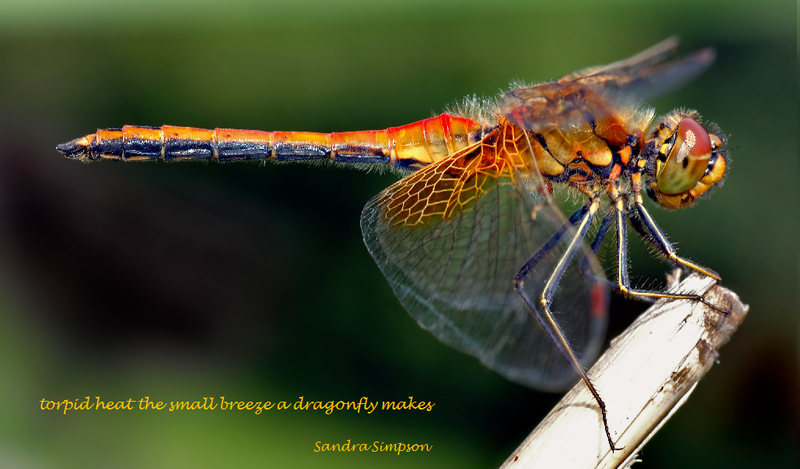 The multi-talented Jennifer Hambrick – classical musician, singer, radio host, poet and photographer – is running the second International Women’s Haiku Festival on her blog, Inner Voices and posted three of my haiku for the March 20 entry. Her commentaries are insightful and sensitive so I am grateful to have been included. This haiku has been rejected previously – by male editors. Jennifer understands exactly what I was saying and which life stage I was at! Here’s another on the topic that was published in NOON 13 (Japan) last year. The editor of this journal is a man so I wondered if he’d experienced this from the other side! The build-up to menopause is recognised as a condition all on its own (perimenopause) and certainly there were times when I’m sure no jury would have convicted me. Demented was about right! Those Women who Write Haiku by Jane Reichhold is available as a free download and is well worth a read. In it, she surveys the earliest known women writing haiku in Japan through to 1990 and English-language poets. Chigetsu’s son was a student of Basho and she was able to meet the master over a period of about 2 years. Uko was married to one of Basho’s closest friends, the doctor and haiku poet Boncho. And finally, a tribute to Marlene Mountain (b 1939), who died earlier this week. Born Marlene Morelock, this distinctive and unique voice in haiku was married to haiku poet John Wills (1921-1993). She changed her surname to Mountain to celebrate the mountains of her home state of Tennessee. An activist feminist, Marlene began writing haiku in the 1960s and her work was experimental from then until her death – she was one of, if not the, earliest practitioner of one-line haiku in English. Read her work here. Her first book was old tin roof, published in 1976. 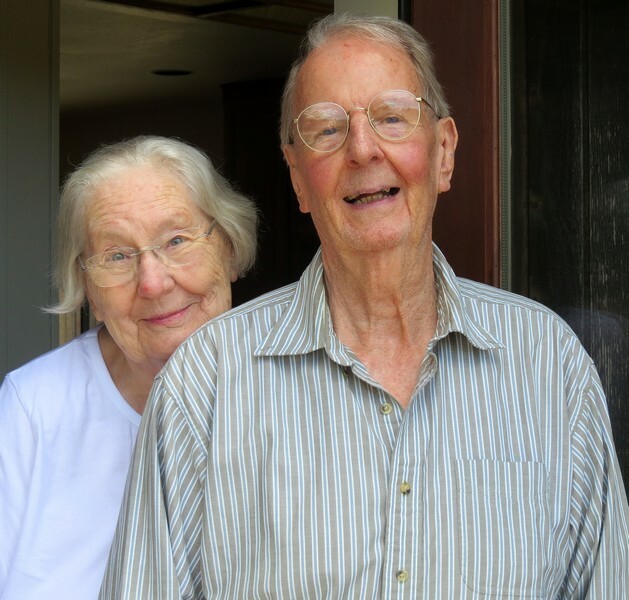 Read an essay by Jack Galmitz in appreciation of her work. Last night’s Katikati Haiku Pathway Committee meeting began with a visit to a brand-new pathway poem, our 44th haiku. 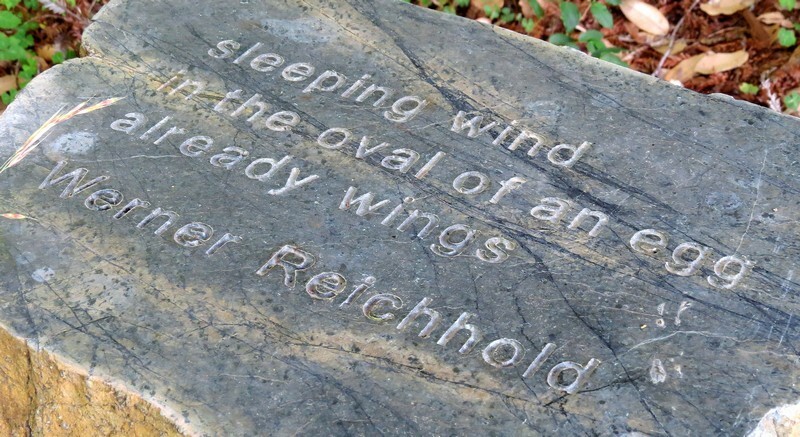 Our delight in the organic, yet sophisticated, look of the work is tempered by the fact that poet Jane Reichhold is not alive to have seen it completed. 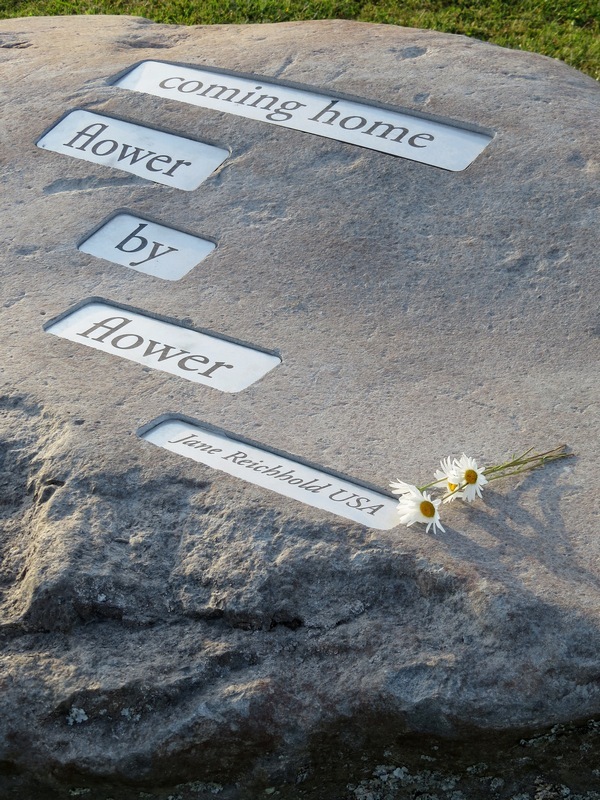 We had corresponded by email over a period after requesting permission to use her haiku and know that she was honoured and excited to have her poem used on the Pathway. As usual, the project has been a community effort. It has been able to go ahead thanks to a donation from the Twilight Concert Committee – the Pathway reserve is now a permanent home for the summer concerts. 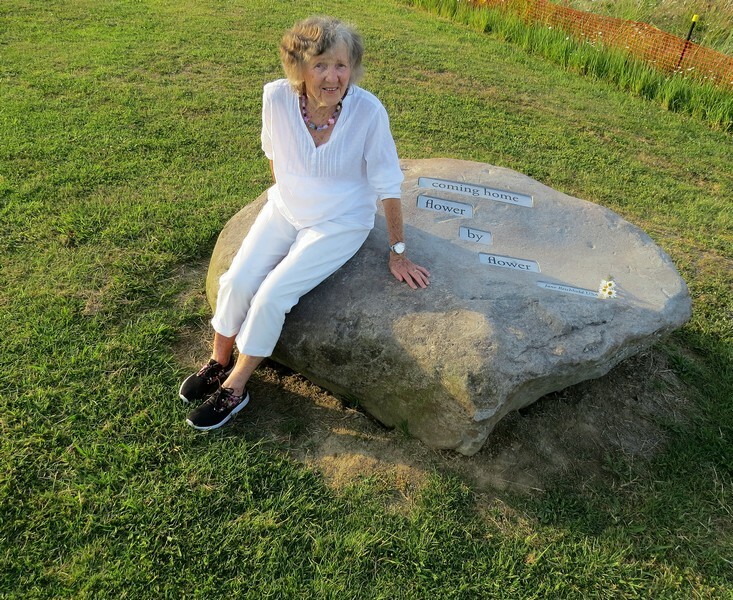 The metal plaques inscribed with the poem have been made by Stainless Downunder, a Katikati company, and fitted into the rock by fourth-generation stone mason Paul Gautron who has inscribed many of the pathway’s poem boulders. The boulder was purchased from Carine Garden Centre and lifted into place, free of charge, by Tom of Fotheringhame Contractors who are working on the next-door stage of Highfields. And none of it would have been possible without the support of Wayne Allchorne, our Western Bay of Plenty District Council parks officer, and his boss Peter Watson. Stay tuned for the announcement of the 45th haiku being finished! Read more about the Katikati Haiku Pathway, a free walk that is open every day.